Belt: Lunar Belt (random world drop) or Cord of the Slain Champion (From Warlord Zon'ozz), etc. Cape: Kharmaa's Shroud of Hope (sold by G'eras, in Shattrath City), Icy Cloak (made by Tailoring), Cloak of the Everliving (drop from Watchkeeper Gargolmar in Hellfire Ramparts), etc... the possibilities are endless. This is my favourite transmorgrification set as a heal Priest! Actually, there's a belt which fits quite great with this set as well, from High King Maulgar (Gruul's Lair). Just saying for anyone that wants as many pieces as possible. I want this as much as some ice cream right now. It is unacceptable to ignore the unseen parts. According to @Niaw, the color of Angelista's Sash is wrong. Sorry for misguiding. Nethershard Girdle from Moroes in Karazhan fits better with the set imo. This set uses the white-with-brown (officially "Orange") variant of the "Priest Raid F" artwork and is composed of a recolour of the Priest Tier 6 set. There aren't any available pants, of the same artwork and colour, for this set. If they existed they'd be in the same format as Leggings of Absolution, except the side panels would be white, the legs that same odd brown as the middle of the skirt, and the chainwork gold. The pants mentioned above, Adorned Supernal Legwraps, aren't the same artwork as this set, unfortunately. Not a huge problem, though, since the pants are hidden by the robe. They also do match eerily well for different artwork! Sadly I can't find a belt or bracers of the same artwork and colour, either. From the artwork files, if the belt existed it'd look like Belt of Divine Guidance only the blue would be lighter and more turquoise and the metalwork would be bright gold to match the chestpiece. Angelista's Sash, mentioned above, is too dark, unfortunately, and actually belongs to the "White" variant of the same artwork (the so-called "White" artwork set is actually mostly black!). Nethershard Girdle, also mentioned above, is not from this artwork at all, even though the blue is a closer match. The bracers would resemble Wristbands of Divine Influence, only with the same colouring as the bracers, and a white band across the middle where the other has dark blue. If I had a mage this is the set I'd be doing transmog runs for. There's no matching belt. The closest I could find was Belt of Faith (priest t3), but I seem like the last person on the planet to still have it, and it's no longer obtainable. Well. There is -one- matching belt. The closest I could find was Belt of Faith (priest t3), but I seem like the last person on the planet to still have it, and it's no longer obtainable. For this set, I like the Lunar Belt. It matches the brown, turquoise, and gold of the set quite well. It's a low lvl world drop, so good luck searching the AH for it, although Spiderkeg mentions below that he's had some success farming it from Dire Maul. Link to the full set + belt, so you can decide how you like it. Edited to add: Since everyone liked my belt recommendation, I'll add that when I wear this set, I use different gloves. Unlike the blue and red variations of this set, the white robe has really lovely sleeves that, unfortunately, get hidden beneath the set's poofy gloves. Wearing gloves that stay beneath the sleeves, like Gloves of the Cleansing Flame or Dolomite Adorned Gloves, let you show off the unique art of this recolor. Don't trust wowhead's model viewer on this, as it has a weird bug where the art of the gloves paints over the art of the sleeves. If you want to see the sleeves, you can look at this model, with no gloves on at all. If you are a cloak show-er like I am there is a nice one from the G'eras in Shatt. The cloak is Kharmaa's Shroud of Hope. It completes the set very well. For the completist out there, another simple (very simple) transmog alternative for the pants are Padre's Trousers, which drop from Illyanna Ravenoak in Dire Maul West. A very basic pair of brown shorts. I think Ruthless Gladiator's Cord of Accuracy is the perfect fit for this set. Blends perfectly with the robe. The only thing a bit out of place is the little green stone in the middle. The cloak commonly agreed to be the best match is Kharmaa's Shroud of Hope. It costs 312 JP from G'eras, a Naaru vendor in Shattrath. If you prefer to have open sleeves in this set, like I do, Handwraps of the Cleansing Flame works very well for this. The Chillbane Belt also makes for an average belt option, you can't tell it is out of place from a distance. Intensity off of Ignis the Furnace Master matches this set to a tee, very nice addition for transmog. I've also seen a lot of suggestions for belts, but so far the belt i've found to fit best is the Belt of Transcendence. The blue of the stone is an exact match to the blue highlights found in the robe. The only drawback is the priest-only specification, making it unavailable to other clothie classes wishing to get this set. A beauty of this version of the set, is that you don't have to be a priest to use this one. may be a silly question, but is there anything remotely close to this set for a holy pally? at least the hood? Vengeful Gladiator's Mooncloth Mantle (and its Satin equivalent) are the same model as the amice in this set. Costs 750 honor points from Kezzik the Striker. The same vendor also has equivalent gloves and cowl (Vengeful Gladiator's is the set you want), at 750 and 1000 honor points, respectively. 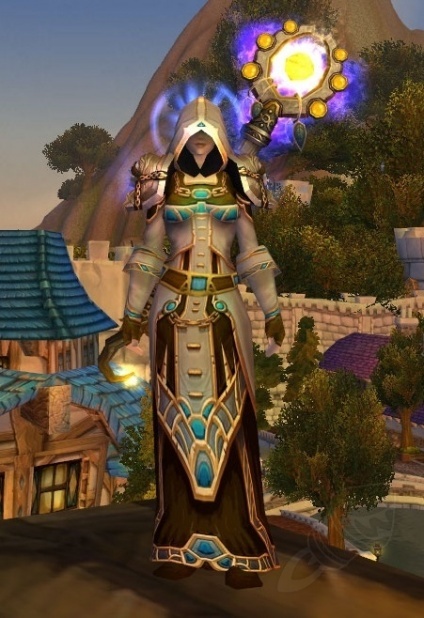 Looking to get this set for my priest, the Staff of Immaculate Recovery, Belt of Arcane Storms and Billowing Cape seem like excellent mats to finish this set. But that's just my opinion. BTW Bracers are not needed to work with this set. Their hidden by your gloves and Robe all ready. A good waist match for transmogging is the Nigh-Invulnerability Belt, crafted by engineers. The cream is slightly off (only really noticeable when zoomed way in), but the brown matches and the accenting complements the buttons down the front of the chest piece. I have been using Sash of Relentless Truth for this set and I think they match fairly well. A'dal's Gift is the best belt option. It blends in perfectly! I like to use Replica Virtuous Gloves for gloves instead. They hide under the robe which looks more attractive, in my opinion. Costs 55 darkmoon faire tickets. Another belt that matches the set is Titan-Forged Cord of Salvation. It is also quite easy to obtain (as long as your faction has Wintergrasp. that is). hey wowhead! why is this cloth set listed under plate sets? Hopefully this helps speed up the search/collection process! If you are looking for a belt that fits this set, dont mind the other belts that has been posted here. Go for the Nethershard Girdle " Nethershard Girdle " from Moroes in Karazhan. Ive uploaded a screenshot, where you can see the belt on the robe. As of 5.1 the boots have been removed from the game. I asked blizzard and they didn't give me a reason. Personally I have no clue why they remove items that are essential for a set a lot of people love. Kinda pissed because I just got the chest to complete it. I found Waterfall Cord to be a pretty good fit. if you're a mage or warlock make sure to use the drop down box to select "all" as they wont show otherwise being spirit gear. For those who have shoulders and head but just cant get goren to drop chest the regal robe or any of its "same models" will do nicely in the interum. The vertigo cloak also works nicely if you are using the regal robe . For those who have shoulders and head but just cant get goren to drop chest the regal robe or any of its "same models" will do nicely while you wait. The vertigo cloak also works nicely if you are using the regal robe. Belt of Divine Inspiration is also a good match for Garments of Temperance and is fairly easy and quick to get. Happy Hunting! There's a belt that is actually a perfect fit for this set, and not just a close match. Lunar Belt which is not farmable. well, it is, but the drop rate is ridiculous, and drops from a billion mobs, so. best chance to get it is on ah. and is easily farmable. Drops from Ok'thor the Breaker, random boss spawn from High Justice Grimstone in Blackrock Depths. With a relatively high drop rate, it's the best bet for this belt. If you're a priest using a mace and looking for a matching MH, I suggest Sporeggar Smasher. It is perfect! Fermenting Belt is another nice match to the recolor set. I like using Hammer of the Astral Plane and Symbol of Transgression together with this set. I believe the colors match really well. I also like pairing it with Ruthless Gladiator's Cord of Accuracy because the gold chains work really well to match the set. I use Regal Gloves for gloves to show off the sleeves of this robe which are very different than the look of the gloves. I think it looks great together. This is the Item Set I use for it. Hope you find this usefull. Anybody know of a good off hand that would go perfectly with this set? Trying to farm the gear so adding one more wouldn't hurt. Surprised nobody has mentioned this Belt of the Long Road. If you're looking to use some low profile gloves to show off the sleeve details on the robe, the gloves of prophecy go surprisingly well with this set. I also like the gray hair cloak more than the low res white cloaks that everyone seems to recommend. easily obtainable with justice points too. I have a feeling Key to the Planes would look perfect with this set! I've been farming for 3 months for the chest,and still no drop :(. looked over the comments and saw my fave staff for this set wasn't mentioned! Apostle of Argus blue glow matches that on the shoulders and the color of the handle matches the rest of the set. Vengeful Gladiator's Spellblade fits this set if you're looking for a dagger. If you are very unlucky like me and the only piece that hasn't dropped yet is the chest you could temporarily use Robes of Koegler as a replacement. Its not the same but its gold, grey and blue matches the rest of the set and actually looks pretty decent. With a fairly good drop rate of just under 4% its easy to farm from Normal Mode Scarlet Halls (Level 31+ dungeon). I was able to do a single run in ~5 minutes on a level 90 priest (since its able to 1 hit everything at that level) and since the low level mobs cant hit you you just need to run through and pull everything to kill koegler at the end. Still no match for the original chest-piece though. I think Angelista's Sash is the real match of this 'Absolution Regalia' recolor, and nobody said anything about it!. There are several belts that I think are good fits for this. My top pick is Celestial Belt, but a couple other that are decent matches are: Aurora Sash, Bright Belt and Sash of Jordan. Belt of Faith matches perfectly with this set! Too bad it's so hard to get. I've never seen it on the black market. Saw this on a very well pvp geared warlock. I have to say that I was amused at the thought of people mistaking him for a priest. Looks like I'm going back next week and beyond! I tried to take all the recommendations that people had for belts, and a few other alternate pieces and put them in a one-stop-shop Item comparison. I hope this helps people trying to find a belt that they like for this set. Personally, I wish a Blizzard artist would just create a belt off the tier template using the color scheme of this set. Goes great with Blessed Robe of Undead Cleansing. It finally payed off for being such a hoarder. Sash of Relentless Truth or any other Dragon Soul normal priest belt looks decent with this set. How do I recolor transmog sets? I want the scourgelord set for the hunter in black, but I see the reddish and blue. How do I recolor? While I was farming T6 I tried this one and I must say that it looks better than T6. Goes wonderfully with Staff of Argus. The only problem I see is that the chest is not that cool, it seems like a pijama. T5 chest looks like it could go better. Tried but it seems like the white colors of T6 and T5 dont match... Too bad... Still will have T5 chest for a while. Is this set white and gold, or black and blue? ok, new items for this set, with the wod expa. same chest, hands, head, Slaughterhouse Spaulders for shoulders, Deckhand's Rope Belt for the waist, but only the normal drop, and Cavedweller's Climbers for feet, preferably the heroic ones. But as far as feet goes, too many items look almost the same. Also, for weapon, i use Hailstorm with mongoose illusion, looks rad, and with these shoudlers and the whole thing, Tabard of the Lightbringer goes pretty well. i've been getting compliments. Wish i could wear this irl. Actually Belt of the Tempest fits really nicely, it's really simple and the style of the belt goes fantastically with the style of the actual set, it's a fantastic match and use it on my mage. Unfortunately it is only for mages. I have the regalia on as a mage. I get comments like "why is a mage dressed like a priest?" Ugh. People can shove it. I love it. A belt that works really well because it has a blue diamond on the front matching the blue diamonds on the robe is the Cord of Unhinged Malice Cord of Unhinged Malice 710 ilvl. You can buy it from the auction house. The only back that I've liked with this is The Maiden's Tattered Sail, Maiden's Tattered Sail which is a super easy pickup in Arathi from a quest. For the feet Embroidered Spellpyre Boots work really well, the gold trim works really well with the robe. I think Girdle of Soulful Mending is a perfect waist to this set, it matches perfectly with the sleeves and robe. A) The gold accents match. B) The light-blue/purple portions also match. C) There are brown accents. D) Stylistically, portions of it line up perfectly with the chest. There's really no contest here at all -- if there is a set belt for this recolor, that's it. Either this screenshot is from a private server or there is a truly perfect match for this set's belt. I'm amazed no one has mentioned this, but BY FAR, the best choice for a matching belt, is Healer's Belt of Final Winter or Belt of Embodied Terror that drops from Tsulong or Lei Shi in Endless Springs. If you dislike the big gloves that are a part of the set, Exiled Dabbler's Gloves are a good choice of gloves for transmogging purposes since they show up very little under the robes if at all. Absolution Regalia (Recolor) with Lunar Belt and Staff of Immaculate Recovery. Imho i think Tyrannical Gladiator's Cord of Cruelty looks great with this set, easy to get and looks perfectly fine. My outfit version of the Absolution Regalia (Recolor) transmog set with some personal picks for bracer, shirt, cloak, belt, pants and staff. I've done a little research and I found out that Lunar Belt is the appropriate match. Usable by any cloth class. This is a transmog set that complements the Holy Priest legendary belt Al'maiesh, the Cord of Hope perfectly imho. My outfit version of the Absolution Regalia (Recolor) transmog set with some personal picks for shirt, cloak, belt and staff. Lunar Belt fits perfectly with the set. I've been using this transmog set for years and haven never been tempted to change it. It's such a perfect looking set for healing priests. much better looking than Avatar imo. With this set I use Lunar Belt with Cranewing Cloak,Ethereum Life-Staff, and Golden Lotus Tabard.